Once upon a time, Boyd Buser planned to become a small-town Iowa physician. That all changed in his final year in the College of Osteopathic Medicine and Surgery, now DMU, when he served as an osteopathic manual medicine fellow. It also launched him on a career of professional leadership and service that earned him the 2010 Andrew Taylor Still Medallion of Honor, the highest award conferred by the American Academy of Osteopathy (AAO). The medallion is presented to AAO members who have exhibited an exceptional understanding and application of osteopathic principles. “It’s great to be recognized by your peers, but it’s also humbling when I look at the people who have been given the award in the past,” says Buser. 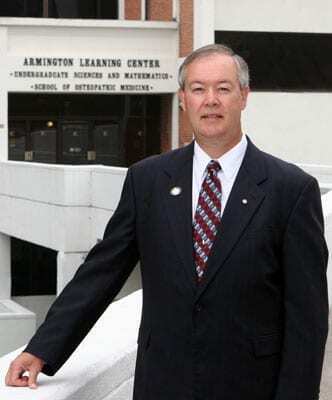 A former faculty member at DMU and the University of New England College of Osteopathic Medicine, Buser has been vice president and dean of the Pikeville College School of Osteopathic Medicine since 2007. That year, he became the first D.O. to be elected to the Current Procedural Terminology® Editorial Panel by the American Medical Association (AMA) Board; that’s key, he says, because the panel has “final say” on the most widely accepted medical nomenclature used to report medical procedures and services under public and private health insurance programs. That goal has motivated Buser since his DMU days. Past president of the AAO, the New England Academy of Osteopathy and the Maine Osteopathic Association, he has served on the American Osteopathic Association Board since 2004. He has taught extensively around the world and has represented the American osteopathic profession in several World Health Organization initiatives.